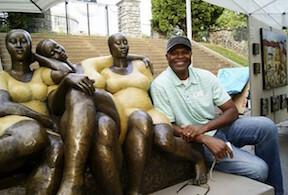 Okonkwo credits his mother’s encouragement and support for pursuing art seriously. He was born in 1965 in Eastern Nigeria and earned a degree in painting in Nigeria. At six feet nine inches tall, he began playing basketball and was later recruited to play college basketball at Brigham Young University-Idaho where he earned a Bachelor of Fine Art degree in sculpture in 1993. He then earned his Master of Fine Art degree in sculpture from Brigham Young University. He met and married his wife, Deidra, in Provo, Utah. They live in Fayetteville, Georgia. 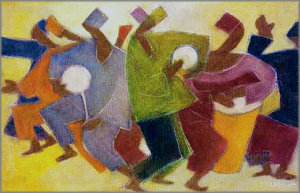 His work is exhibited throughout the United States and is found in public and private collections. Okonkwo is a member of The Church of Jesus Christ of Latter-day Saints. This page was last edited on 14 November 2016, at 15:28.